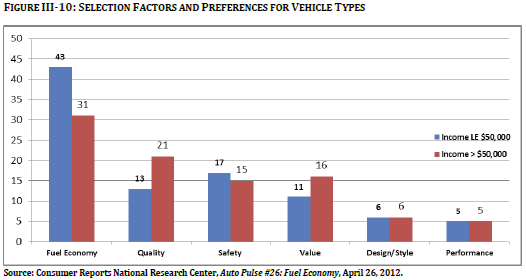 Consumers clearly support requiring more miles per gallon. The Consumer Federation of America conducted a poll of 1000 adults in May 2012 with a margin of error of three percentage points. Respondents were asked a number of questions pertaining to fuel economy. 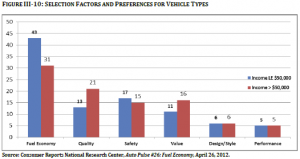 ‚Ä¢ Consumers support the 55 mpg standard. Respondents were asked for reactions to the proposed 2025 standard of 55 mile per gallon for motor vehicles. Three quarters (74 percent) said it was a good idea. ‚Ä¢ Even if it meant a higher sticker price, consumer said they still support the standards.